TRAINERS Roger Fell and Keith Dalgleish were the men in form at Ayr Racecourse’s two-day opening July meeting - each saddling a double. Fell teamed up with jockey Tony Hamilton at totepool Family Day on Sunday with Two For Two, just beaten a nose in the same race last year, winning the feature race, the Class 3 one mile handicap carrying top weight at odds of 7-1. And it was Dalgleish’s turn to score a double on Monday with Dark Defender and Showdaisy. The latter landed the £15,000 Racing UK Profits Returned to Racing Handicap. Sent off at 12-1 Jason Hart gave her a positive ride making all to win the five furlong sprint by a head from Foxtrot Knight. The yard’s earlier winner came with Dark Defender, a 15-2 chance, who had won on this card last year. Given a positive ride from stable apprentice Rowan Scott the gelding had a length and a quarter to spare at the line over Kenny The Captain. 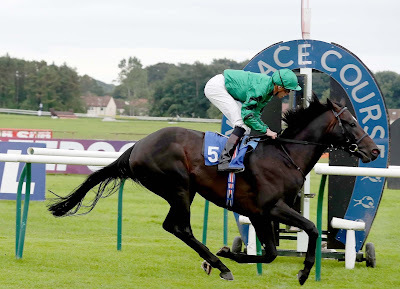 Newmarket based trainer George Scott scored with his first ever runner at the track on Monday when Another Batt (5-6 fav) won the opening six furlong novice stakes in the hands of Danny Tudhope. But an eyecatcher here was the first time out colt Stormbringer who finished third for trainer Kevin Ryan and jockey Martin Harley and should win in the near future. There two Newmarket trained winners on Sunday when John Gosden sent the highly thought of Pouvoir Magique on the 700 mile round trip to win the opening maiden comfortably at the prohibitive odds of 1-12 in the hands of James Doyle and this colt could now go for the Group 2 Great Voltigeur Stakes at York next month. And David Lanigan and jockey Paul Mulrennan teamed up with Take A Turn, sent off at 11-2, to win Division Two of the Bet totequadpot At betfred.com Handicap over one mile two furlongs by a neck from Never Say.